The conclusion of E-world 2019 in figures: 780 exhibitors from 26 nations attract 23,000 visitors. Visitors surround the sleek two-seater, polished to perfection, on the E.ON exhibition stand. But what is a MAG Classic sportscar, a vintage English car from the 1960s, doing at E-world? One clue is the box hanging on the wall beside it: a charging station. The vintage car was fitted with an electric motor with a range of 150 kilometres. The converted sports car is one of only a handful of exceptional situations in which industry innovation becomes tangible. If something is showcased, then it is normally charging technology for e-vehicles or digital power meters. Other than that, screens and tablets dominate most stands. An unmistakable sign that digitisation is massively changing the sector. The key themes of E-world 2019 – ‘smart city’ and ‘climate solutions’ – have placed topics such as connectedness and smart solutions, based on sensor data and algorithms, on the exhibitors’ agenda. 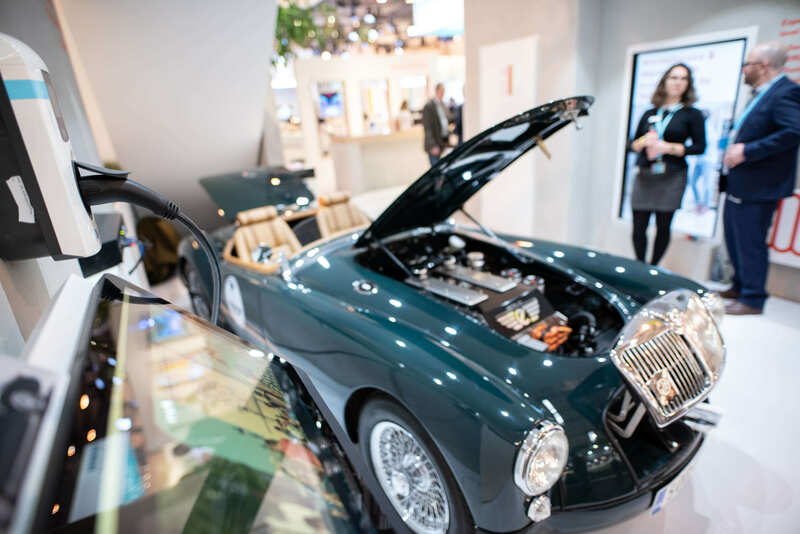 Vintage car with electric motor: The MAG Classic sportscar was one of the tangible industry innovations at this year’s E-world (© E-world energy & water GmbH, Photographer: Mike Henning). Even if the visitors are, understandably, not offered many tangible attractions, players from the world of politics and business have responded positively to E-world, which came to a close on the 7 February. “The entire energy world is looking to Essen”, said State Secretary Thomas Bareiß (CDU) at the opening of the event. Germany was still at the “core of the energy transition”. The show organiser was able to report encouraging figures. “Totalling 780 companies, there were more exhibitors at E-world than ever before,” explained Niels Ellwanger, CEO of con|energy AG. The companies came from 26 nations in total and a fifth of the exhibitors were foreign. However, not only the range of products and services, but also the audience is becoming increasingly international. More than one in four trade fair visitors had made the journey from outside Germany, with Britain and Switzerland being particularly well represented. Around 23,000 visitors came to the Essen exhibition halls over the three days – slightly more than in previous years. According to the organiser, it is almost exclusively an industry audience. “We are particularly pleased that we were again able to welcome more decision-makers. Four out of five E-world visitors hold a management position, which underlines the importance of the trade fair perfectly,” says Oliver P. Kuhrt, Managing Director of Messe Essen. Another topic of discussion at the fair was of course the recommendations of the Growth, Structural Change and Employment Commission to phase out coal by 2038. Marie-Luise Wolff, President of the Federal Association of Energy and Water Industries (BDEW), called for the proposals to be implemented precisely as outlined. “Politicians shouldn’t discuss it to death,” says Wolff. At the same time, the BDEW President sees this as “a huge opportunity to give the energy transition a boost”. The energy industry could become a growth industry once more. “The development requires not only massive investments in additional renewable energy capacities, but also additional investments in security of supply,” Wolff said. But e-mobility not only affects the “Climate Solutions” spectrum, but also that of the “Smart City”. If more and more cars are powered electrically, the overall and – more importantly – selective demand for electricity will rise significantly. One example: If many EVs are recharged at the same time on a residential street, for example after work, the distribution network will be subjected to heavy loads. Intelligent load management could compensate for this. Exhibitors showed how houses and areas could be supplied with locally generated energy and how electric vehicles could be integrated. Another project: In the future, smart street lamps could offer Wi-Fi, display free parking spaces or serve as charging stations. After taking it for a spin, the English vintage car could then easily be charged at the next street lamp. en:former was your eyes and ears on site and followed E-world energy & water from 5 to 7 February 2018. We posted various specials, in which we report on innovations, trends and conferences. Stay en:formed!